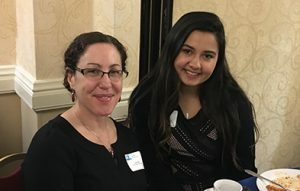 Scholars’ recognition: Teacher Lana Hower and senior Kira Kested of Greenville were honored by CASDA. Senior Kira Kested of Greenville was recognized by the Capital Area School Development Association (CASDA) as a high achieving student for its annual scholars recognition. Kested attended CASDA’s 31st Annual Scholars’ Recognition Dinner on Wednesday, May 17 at the Marriott Hotel and Conference Center in Albany. The event recognizes high achieving high school seniors from public, private, parochial, and BOCES secondary schools in the Greater Capital Region. It also honors teachers nominated by each student scholar for having had a significant influence on their education. She nominated teacher Lana Hower. “Ms. Hower has pushed me to be a better student and is always honest,” Kested said in the nomination. The ceremony featured more than 500 exceptional high school seniors, their parents and the teachers who most influenced their academic careers in attendance. Students are selected not only for their academic achievement, but also for their qualities of citizenship and leadership. The students and educators being honored come from eleven counties in the Greater Capital Region including Albany, Schenectady, Saratoga, Rensselaer, Fulton, Montgomery, Greene, Columbia, Warren, Washington and Essex counties. The Scholars’ Recognition Program is part of the innovative business-education partnership formed by the School of Education at the University of Albany to honor excellence in education. This year’s sponsors include Stewarts, Capital District Counseling Association, University at Albany School of Education, Freihofer’s, Whiteman, Osterman & Hanna and CSArch.